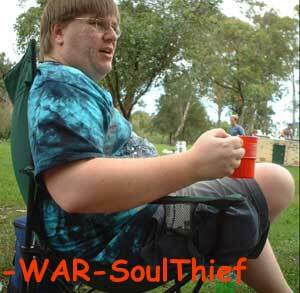 Late in the year 2000 myself and [POD]AntiSocial got fed up with the juvenile and rude behaviour of many of these other online gamers. He disbanded POD after some nastiness with a particular player. I left uY due t ongoing conflict between that clan and MKK (some members of which I had had a solid relationship). 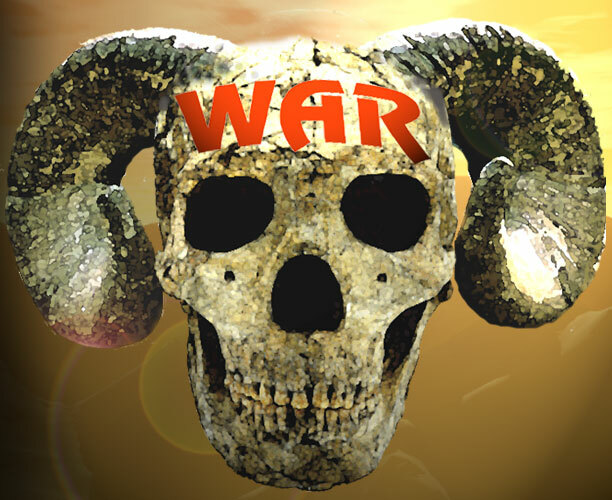 We formed a gamer clan called Warriors Assassins Rebels – or WAR for short. One day we met in a pub called the Lord Nelson down at the Rocks in Sydney. I discovered that AntiSocial was an Australian Army Corporal named Attila (real name, and he was Hungarian). We became Violator (later Torn) and SoulThief. Truth be told, not many of these stayed long. Storm Agent, -LiZaRd- and Instinct were gone within a month. But Warmonger I got to know. He turned out to be an arty-type guy living up in the Blue Mountains just west of Sydney. There he made his own furniture. I visited him once. 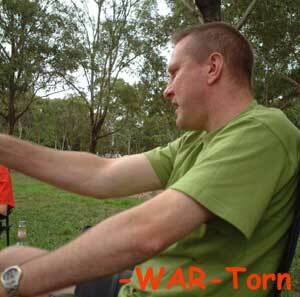 Machine and his son cRafTy, however, were probably WAR’s longest continuous members after my departure. Machine was professional fisherman-come-chef-come-tourist guide from best I can tell. Some months later we also recruited FrankBooth who actually turned out to be two players using the same account. So one remained as FrankBooth and the other became Evil. Another player called BadCrabs also joined. 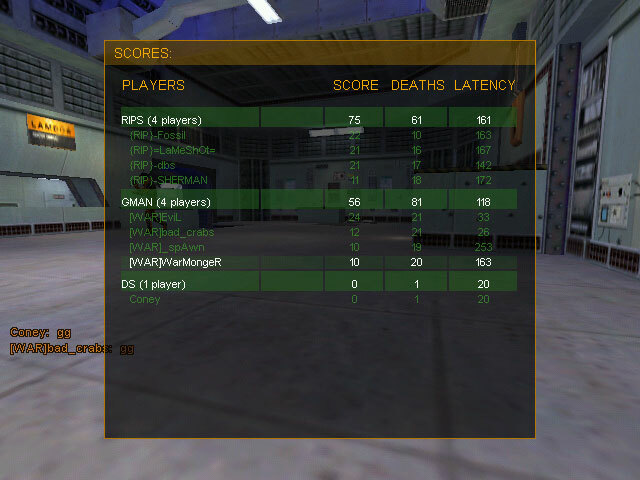 Our core game at time of formation was Halflife Deathmatch (HLDM). This was a fun, fast and furious game. Torn designed the original web page and here is a link to an early 2001 version of that page as it stands. Later I developed a little simple flash splash page. We also adopted the Spawn model as our original clan game model. 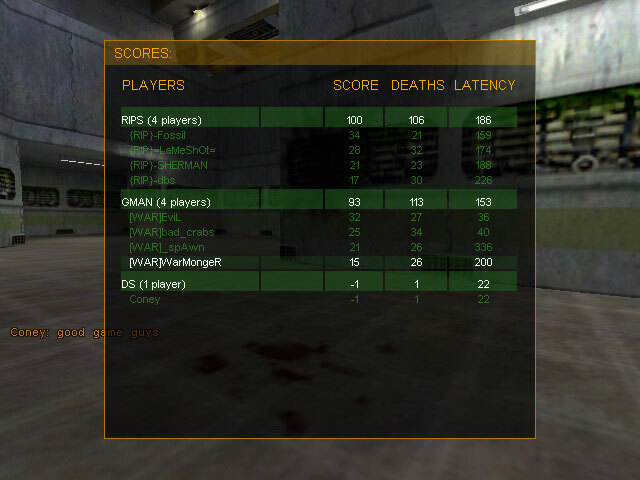 This is because one of the great things about Halflife Deathmatch is that players could infuse their own models. 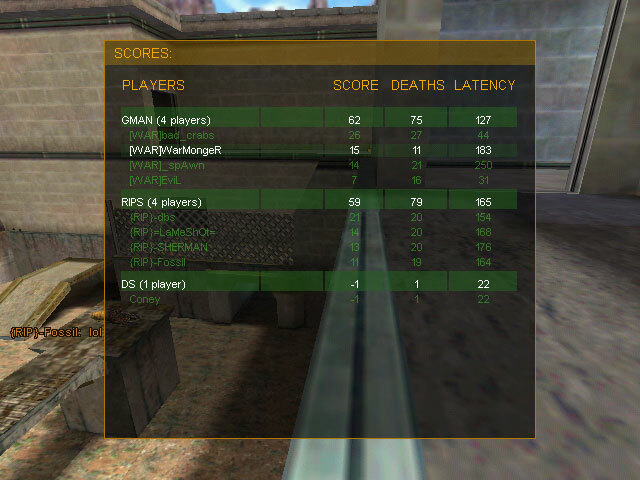 However over the next two years the clan started to expand and existing members were being attracted away from HLDM to other games such as Team Fortress Classic, CounterStrike, and Day of Defeat. And behind the scenes I started playing a very early version of a game called Urban Terror. By late 2001 the web site look changed again. I also developed for WAR a set of clan rules that I called “Jus in bello (that which concerns the justice of conduct within war)”. At the time I knew no other clan with a set of rules. Maybe we were the first. Maybe not. But certainly we were the first that I knew of to have a very comprehensive range of rules covering everything from conduct, to naming, to recruitment and so on. These came from my years in the workplace. And as the clan grew so the shared sense of craziness grew. And so it came to SoulThief in a vision that the army he was gathering should be annointed. In the vision he travelled the black caverns which lay beneath the Citadel of WAR, led on by the laughing crystal skull. At length he found a river of blood which plunged down un-named falls to an abyss of unnatural cold. Here there was a bridge made of men’s thigh-bones and beyond that bridge stood a huge figure obscured by a red mist. SoulThief was not certain what the figure looked like, but power emanated from it. 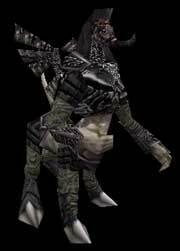 SoulThief began to cross the skeletal bridge but the figure bade him stop. 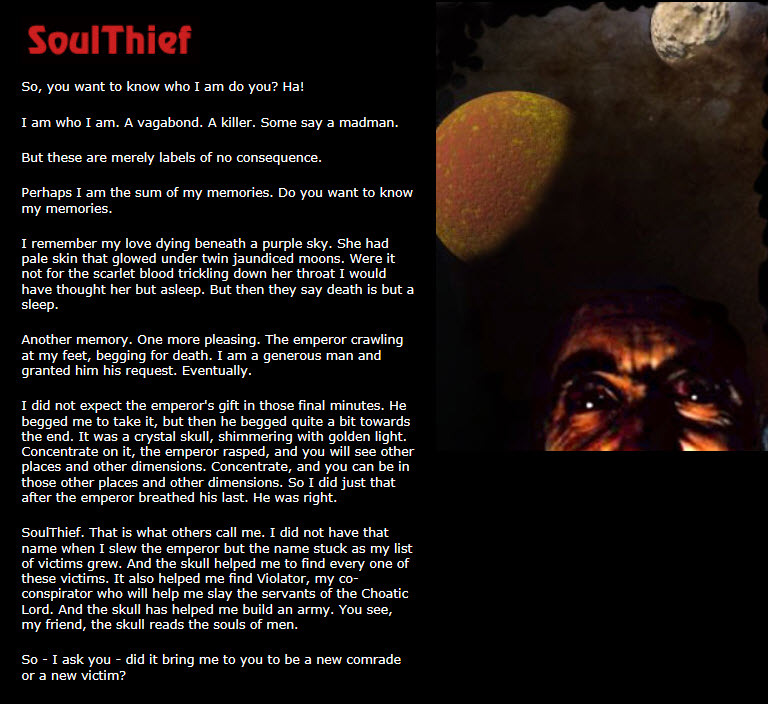 SoulThief laughed in his madness. The man he had been had died years ago, replaced by this immortal lunatic. The figure stood still for several moments – neither replying nor seeming to note the passage of time. At length the figure spoke once more, with a voice like gravel that scrapes the scars of the mind. SoulThief did not reply. Truth requires no comments. The huge figure chuckled and stomped a foot, the earth groaned and a boom echoed round the cavern. 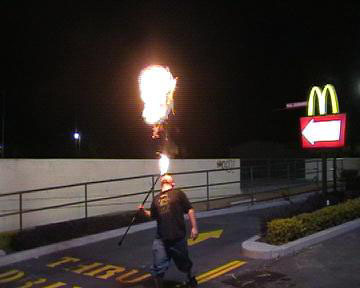 When the words were finished the earth rumbled and shook and the river of blood began to burn with a fierce unnatural fire. The huge figure was slowly obscured by darkness and the laughing skull beckoned once more. The audience was over and in his vision SoulThief trekked the subterranean wilderness back to the citadel where he awokw in his room to find himself dressed and his boots covered with subterranean detritus. So SoulThief gathered his army, his clan, his tribe and told them of the vision. And the warriors, assassins and rebels knew deep destinies were being wrought through them. Finally some truth “For those about to Rock (game)”, we salute you !